1. Preheat the grill to medium. Bring a small pan of water to the boil, add the quinoa mix and cook according to pack instructions. Cut one of the aubergines in half lengthways and place it, cut-side down, on a baking tray under the grill. Cook for 15 minutes without turning, until charred. Remove and set aside until cool enough to handle. 2. Meanwhile, cut the remaining aubergine into chunks. Place 1 tbsp of the olive oil, the pomegranate molasses, sumac, garlic and seasoning into a large bowl and mix together. Add the aubergine chunks and toss to coat evenly. Thread the chunks onto 2 long metal skewers and place under the grill when you remove the whole aubergine. Cook for 10 minutes, turning often until golden and tender. 3. Finely chop the parsley and place into a large bowl with the walnuts, pomegranate seeds, 1 tbsp olive oil and 2 tsp lemon juice. Mix together, season, then stir in the cooked quinoa. 4. Scoop the soft flesh from the halved aubergine, discarding the blackened skin. Place into a bowl and mash with a fork, then mix in the tahini, 2 tsp lemon juice and remaining oil. Add a pinch of sumac, salt and pepper to taste and mix well. 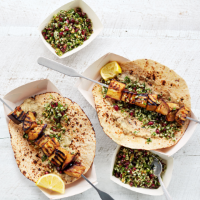 Place a warmed tortilla wrap onto each plate, spread with aubergine purée then top with a skewer and some walnut salad. This recipe was first published in Thu Jun 19 15:23:00 BST 2014.